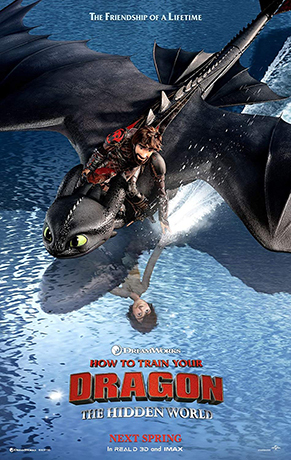 How to Train Your Dragon is arguably the crown jewel franchise of DreamWorks Animation. Shrek may be the face and perhaps the most recognized. But it is the Dragon series that has been the most beloved and consistently the most acclaimed since the first film was released in 2010. The films are among the elite animated titles, boasting some of the most beautiful visuals and emotionally strong storytelling that contend favorably with the likes of Disney, Pixar, and Studio Ghibli. So it’s understandable that the series concluding with the third film would be an emotional one for fans who have followed Hiccup and Toothless’ journey from the beginning. How to Train Your Dragon: The Hidden World opens a year after the events of the second film. Hiccup is now chief of Berk and has successfully transformed his island home into a dragon and human utopia. Yet this supposed paradise of peace is not without issues. The biggest being that Berk is becoming overcrowded with dragons Hiccup and his fellows riders rescue. It’s only a matter of time before hunters turn their attention to attacking the island head on. In an effort to continue safeguarding dragons, Hiccup considers searching for a legendary dragon haven his late father Stoick told him about as a child known as the Hidden World. One night, Toothless senses something peculiar in the woods. There he comes upon a female dragon of similar species to him christened a Light Fury by Astrid. The two dragons are instantly smitten. Only she’s not fond with the presence of humans and flees upon seeing them. Wanting his friend to be happy at finally meeting another like him, Hiccup determines to help Toothless win over the Light Fury. At the same time, he explores his own relationship with Astrid. However, they all find themselves targeted by Grimmel the Grisly, a cunning dragon hunter who is single-handedly responsible for killing Night Furies into extinction. On the one hand, The Hidden World has perhaps the weakest story of the three films. A number of plot elements are not really expanded upon. They’re simply there as a means to move the narrative along when necessary. This is apparent when the majority of the supporting cast has pretty much been pushed to the background with very little screen time for each. And while Grimmel actually makes for a real good villain, presented as a dark mirror to Hiccup had he gone the other way in the first film, it felt like a little more could have been done to really put over how threatening he is to both Hiccup and Toothless on a personal level. Yet the focus of The Hidden World is really in the relationships Hiccup and Toothless have with their romantic interests and with one another. This manages to work very well, enough to make the film as a whole enjoyable. Toothless gets a bit more of the spotlight this time around. His attempts at wooing the Light Fury make for some cute and goofy moments that are wonderfully realized. Parallel to that is how lovingly natural Hiccup and Astrid’s relationship is with their little displays of affection. And the friendship between the two heroes is played out quite nicely to bring full circle what started in the first film. Jay Baruchel continues to voice Hiccup magnificently. He seems to always make sure that, regardless of the situation, how Hiccup sounds doesn’t stray from who he is. America Ferrera gets a healthy amount of scenes to voice Astrid, letting her to shine as a young woman with a strong voice while having a playful side. F. Murray Abraham I really like as Grimmel. He provides the kind of sinister voice of someone who doesn’t need to yell and still have his words carry menacing weight. The rest of the supporting cast do perform quite nicely that they don’t feel left out. A stand out is Justin Rupple, replacing TJ Miller as Tuffnut. As has been the case with each progressive film in the franchise, The Hidden World boasts some of the most majestic animation around. Photo-realistic visuals without losing its cartoonish appeal. Texture details that are just absolutely stunning to look at. It’s quite amazing that the animators at DreamWorks have managed to improve upon what they’ve done in the second film. The fire and smoke effects are spectacular and the visualization of flight continue to dazzle and inspire breathless awe in new ways. Just about every frame is gorgeous! The actual animation has always been fantastic in the Dragon series and it’s no different for the third film. The personalities of each character are so well defined that their every action and movement fits them wonderfully. I always liked how even the dragon species differ from one another in their mannerisms and interactions. This is played out very well in the lead up to and when Toothless tries to mimic the mating rituals of other dragons to impress the Light Fury. It’s one of many sequences that make the characters so lovable and charming. The music score by John Powell is once again a delight to listen to. With Toothless getting a bit more of the spotlight in The Hidden World, the music is allowed to be better appreciated than in the second film and really enhance the drama and emotion of each scene. Some of the new themes probably won’t come off as memorable until after listening repeatedly, but they’re no less beautiful. And speaking of the themes from the first two films, when they are reused they’re played in ways that really hit home how wonderful the series as a whole has been. Writer-Director Dean DeBlois is to be commended for bringing the How to Train Your Dragon franchise full circle with The Hidden World. The story has its flaws and it is not perfect by any stretch of the imagination. But he does tell enough of a compelling narrative that brings Hiccup and Toothless’ wonderful journey to a satisfactory conclusion. Coupled with the always beautiful animation as well as a great cast and a delightful score by John Powell, this is just a lovely film to watch. In particular the heart-warming final five minutes. This entry was written by kelvin, posted on February 8, 2019 at 5:27 pm, filed under Animation. Bookmark the permalink. Follow any comments here with the RSS feed for this post. Trackbacks are closed, but you can post a comment.